A relationship defined by caring for another, trust, faith and concern for welfare of another. From friend + ship. History of this word Friend: A friend is a lover, literally. The relationship between Latin amcus "friend" and am "I love" is clear, as is the relationship between Greek philos "friend" and phile "I love." In English, though, we have to go back a millennium before we see the verb related to friend. At that time, frond, the Old English word for "friend," was simply the present participle of the verb fron, "to love." The Germanic root behind this verb is *fr-, which meant "to like, love, be friendly to." Closely linked to these concepts is that of "peace," and in fact Germanic made a noun from this root, *frithu-, meaning exactly that. Ultimately descended from this noun are the personal names Frederick, "peaceful ruler," and Siegfried, "victory peace." The root also shows up in the name of the Germanic deity Frigg, the goddess of love, who lives on today in the word Friday, "day of Frigg," from an ancient translation of Latin Veneris dis, "day of Venus." Copyright Pittwater Online News, 2011. Images Copyright michale Mannington and A J Guesdon. A Musical Theatre extravaganza and swing night made its way to the Maria Regina College in Warriewood on Friday night, entertaining a large crowd for over three solid hours. 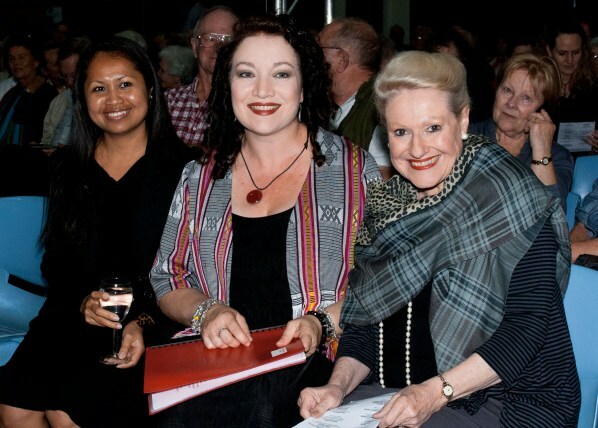 Held at the Marana Centre, Mater Maria College, Warriewood, special guests Estela Ferreira - Goodwill Ambassador to Timor Leste, Maria Jose de Jesus – Consul General of Timor Leste, Hon. Bronwyn Bishop, Mayor Harvey Rose and wife Wilga Rose, Commodore Sloper (Rtd.) and five hundred residents were treated to some wonderful singing and snappy dancing. When asked during intermission what they had enjoyed most so far the answers covered everything offered. Doug Mulray and his lovely wife nominated Girls on Film (Mandy Carnie, Rachael Beck, Danielle Barnes), the first act. Others nominated the short DVD made by David Haythornthwaite on Soibada as what struck a chord most with them. The ladies liked Dean Macrae and David Malek’s renditions of ‘Me and my shadow’ as well as the songs each sang separately. All were wowed by Danielle Everett’s wonderful voice and enjoyed Samantha Shaw’s duet with Simon Hyland. Simon, the man responsible for this delightful evening in asking all these artist friends to join him on the bill, was not only MC throughout the evening but treated the audience to songs, tap-dancing and even accompanied himself when reprising Peter Allen’s ‘Tenterfield Saddler’, a song he has also done justice to in The Boy from Oz. The evening’s headline act was Tom Burlinson who sang tunes from his current ‘Now we’re Swingin’ hit show. His last song ‘New York’ received a resounding applause. The whole bill’s ensemble was a veritable who’s who of musical theatre and caberet and all are residents of the Northern Beaches. All performers joined in a rousing finale of Viva Las Vegas that would have made Elvis smile. Consul General Maria Jose de Jesus then presented each with a thank you gift and traditional scarf from Timor-Leste. The voluntary members of the Pittwater Friends of Soibada worked hard throughout the evening, and were there well after midnight packing up with the sound crew, the only other’s left. Members of the Pittwater Club if Rotary were also on hand throughout the evening, Robbie Walkerdon supplying and arranging fresh bottlebrush as the flower of the evning and Gail Carew selling raffle tickets, wine and handing out refreshments during the intermission. Ross Pitts ensured wine from Two Rivers refreshed palates in generous portions. Children from the Maria Regina Catholic School in Avalon were also on hand with small baskets of handmade chocolate crocodiles and Timor-Leste woven bookmarks to raise additional funds. Even the speakers and PA equipment, usually costing at least ten thousand dollars for an evening like this, was provided generously at no charge. All those involved should be lauded and applauded but none more then Simon Hyland. 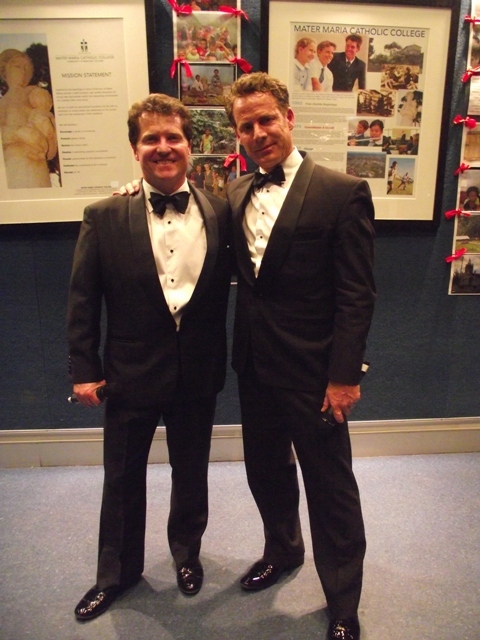 The inaugural concert in September 2010 was also organised and directed by Simon Hyland. Apart from being involved in professional theatre for 15 years, he is now youth minister and music director of the Catholic Parish of Pittwater. 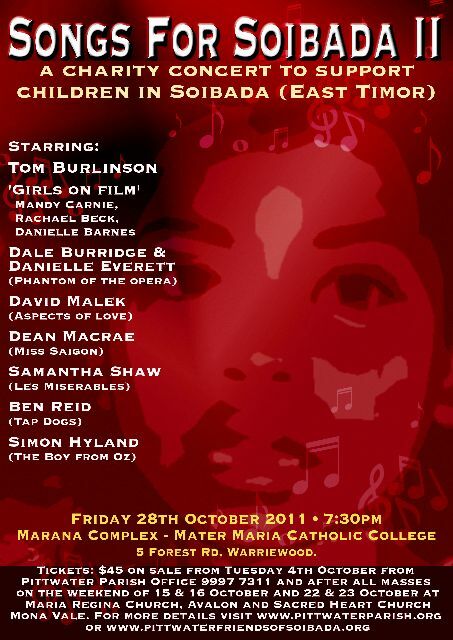 All the funds raised from Songs of Soibada II will go to Pittwater Friends of Soibada, a non-denominational community group raising money for the people of Soibada, a historically important village in East Timor (Timor-Leste). This community based and supported group is our Profile of the week and more images from the evening are on our Pictures page this week.